IWU freshman Kyle Mangas accepts his MVP trophy Tuesday night following the national tournament in South Dakota. The former Warsaw star was named a first-team All-American by the NAIA on Thursday. KANSAS CITY, Mo. – Add another hoops honor to the lengthy list for Kyle Mangas this basketball season. The former Warsaw star has been named an All-American by the National Association of Intercollegiate Athletics. The NAIA announced the 2018 NAIA Division II Men’s Basketball All-America Teams Thursday. Cornerstone’s (Mich.) Kyle Steigenga headlines the award winners as the 2018 NAIA Division II Men’s Basketball National Player of the Year. Players were chosen by the Division II Men’s Basketball All-America Committee. There are three teams of 10 individuals each that make up the 2018 All-Americans. Mangas, a standout at Indiana Wesleyan, is the lone freshman in the country named among the 30 players chosen as All-Americans. Mangas averaged a team-high 21.5 points-per-game in leading the Wildcats to a 31-7 mark this season. 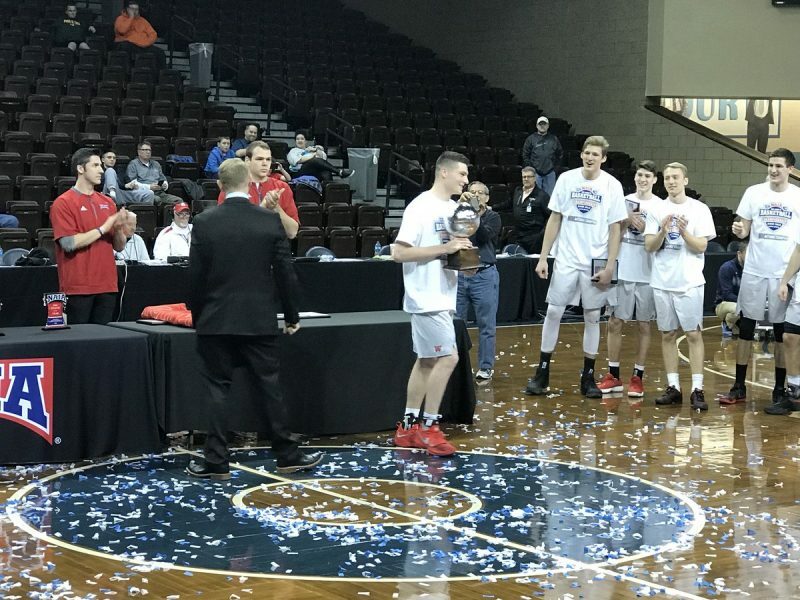 IWU defeated fellow Crossroads League member Saint Francis of Fort Wayne Tuesday night to win the NAIA Division II national championship in South Dakota. Mangas was named the MVP of the National Tournament after he led IWU to five wins in six days. He averaged 22 points and eight rebounds per game in the National Championships. Mangas, who was an Indiana All-Star in 2017 following a prolific prep career at WCHS, was named the Player of the Year and the Freshman of the Year in the Crossroads League. He is the first freshman in league history to earn POY honors. Mangas, the son of Tim and Ann Mangas, led the Wildcats to the regular-season and tournament titles in the Crossroads League. His 818 points this season broke the single-season program record. The Warsaw program was well represented on the All-American list. Former Tiger star Paul Marandet was named as a third-team All-American to join Mangas on the prestigious list. Marandet, a sophomore guard at Spring Arbor, led his team in scoring and assists this season. He averaged 18.8 points and over five assists per game as the Cougars posted a 20-11 mark. Marandet was the 2015 Ink Free News Player of the Year and helped Warsaw to Class 4-A sectional and regional championships as a senior in 2015-2016. Both Mangas and Marandet played for coach Douglas T. Ogle at WCHS. Steigenga, a native of Holland, Mich., is the first player in Cornerstone men’s basketball history to earn this distinction. The four-time first team All-American led the Golden Eagles to a 30-5 record, including a 19-1 mark in the Wolverine-Hoosier Athletic Conference en route to the team’s 10th conference title and a 14th national championship appearance. Cornerstone, which won the national title in Steigenga’s freshman campaign, reached the quarterfinals at the 2018 national championship before losing to eventual national runner-up Saint Francis (Ind.). On the season, Steigenga tallied 727 points (20.8 points per game), 298 rebounds and shot 59.9 percent from the field. The senior’s point total ranked seventh nationally. Steigenga concluded a decorated career with 3,023 points and 1,201 rebounds – both of which rank among the top two totals in program history. Overall, there are five individuals back from one of the three 2017 All-America Teams. Colton Kooima of Northwestern (Iowa) and Steigenga are the only individuals to repeat on the first team. The 10-member first team features Mangas, along with seven seniors and two juniors. Saint Francis senior Bryce Lienhoop earned first-team All-American honors. The second team includes Bethel College senior Gage Ott, a native of LaPorte. Evan Maxwell, a junior center for IWU, earned honorable mention honors. Also tabbed to the honorable mention list was Saint Francis senior Derek Hinen, who played at Columbia City High School. Following the conclusion of the national championship title game, Greg Tonagel of Indiana Wesleyan was named the 2017-18 NAIA Division II Men’s Basketball Coach of the Year. Tonagel led the Wildcats to their third national title – the other two coming in 2014 and 2016 – and a 31-7 overall record. He was also named the NABC-NAIA Division II Men’s Basketball Coach of the Year.